Note: Michaelsberg is also spelled Michelsberg in some texts. In the early 11th Century, Holy Roman Emperor Henry II (Heinrich II) fresh from founding his Imperial Cathedral ("Kaiserdom") founded a Benedictine Monastery on nearby St Michael's Hill -- the Michaelsberg. Since monasteries are supposed to be self sufficient, the monks grew barley and hops for their own use. 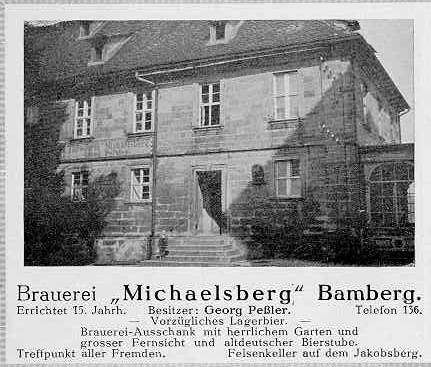 One of oldest mentions of brewing in Bamberg comes from a 1122 proclamation by Bishop Otto I of Bamberg granting the Benedictines of Michaelsberg the right to brew beer for sale. This continued until the early 1800's until the "Great Secularization" that occured after Bavaria occupied Franconia. Most church properties were confiscated and the monastery passed into the hands of the city of Bamberg. Not want to let a good brewery go to waste, they promptly leased the brewery to a local braumeister. A 1818 list of the 65 breweries then in Bamberg (provided by Ron Pattinson) names the leaseholder as Johann Rider.Various other brewers leased the brewery through the years. Sometime around 1900 it came into the hands of the Pessler family who ran the brewery until closed in 1969. Ad from a 1918 Bamberg Guidebook. Courtesy Ron Pattinson. Sometime after WWII the brewery was owned by both Georg & Michael Pessler -- I assume father and sone -- as can be seen from these labels. Even thought the brewery had no ecclesiastical connections, they very much relied on the monastic connction is their advertising, as can be seen in this metal sign, currently hanging the Franconia Brewery Museum. 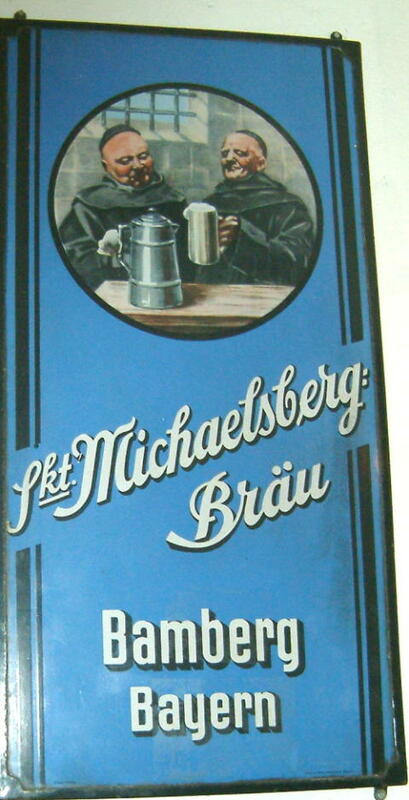 When the brewery closed in 1969 the Maisel brewery bought the rights to the name and they used the name to brew a line of "St. Michaelsberg" beers. The space remained empty until 1981 when it was rented by the new formed Franconia Brewery Museum. Renovation work started in 1984, mostly with volunteer labor from members. The museum opened in 1986 and is a must visit if you are in Bamberg between April and October. 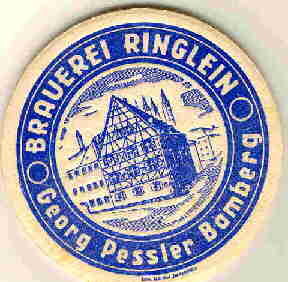 One side note: the Pessler family also owned the Ringlein Brewery in the late 1950's, as can be seen from this coaster from Klaus Ehm's collection.